Spiral bound hardcover, 168 pages, profusely illustrated throughout with black and white photos and drawings. Has lots of recipes for things like mane and tail conditioner, fly repellent, horse treats and bran mashes. Also includes lots of fun social ideas - like parties, games and more. Includes a special section (with pictures and how-to instructions) of Halloween costume ideas. Copy-able forms for gift certificates, and more! 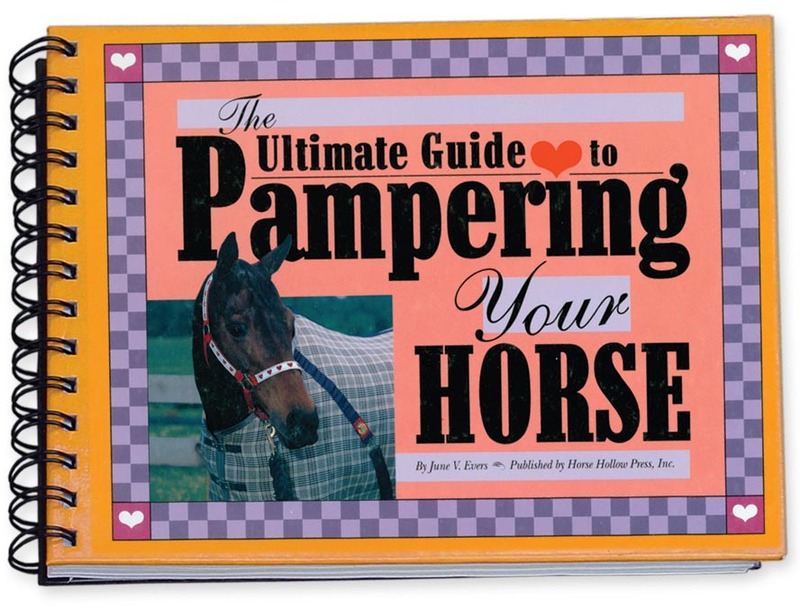 The Ultimate Guide to Pampering Your Horse was written by June Evers, and the first time I saw it, I must admit, the title was a bit off-putting to me. My horses have it made. They live a life of leisure, the best food, farrier and vet care, etc. If I read this book... then I might discover more things I was NOT doing for my already-pampered equines. Then I would have to feel guilty. Horse Hollow Press has been in business for 26+ years. Founder June started out life as a city girl, though she rode and took lessons from an early age. When she wasn't riding horses, she was drawing them, which eventually lead to a degree in illustration from the prestigious Rhode Island School of Design. Before the days of the internet, landing an Art Director job in New York City was considered the pinnacle of success for any designer. But June is not just any designer. She pined for the horses, and ultimately applied her talents to create products for other horse lovers. She started Horse Hollow Press in her tiny NYC apartment and hasn't looked back since. June left the New York City apartment as soon as she could, eventually she and her husband landed in an 1810 historic home on a farm in Goshen, New York. Horse Hollow Press now resides with her horses in a massive poultry barn - converted to horse facility. How appropriate, that after all these years, June can look out of her office window and watch her horses (all rescues) graze. Most small business owners wear many (if not ALL) of the hats needed to make things happen, and June is no exception. Here she is sporting her signature smile, while caulking her roof!